We're dazzled by the state-of-the-art kits that sit on the shelves of the LHS and in our stashes nowadays. Look at the Cyber Hobby SB2C or the Eduard Bf-110E and you'll see the finest examples of how manufacturers are leveraging technology to give us exceptional models that make kits manufactured 30 years ago look like toys. I couldn't explain how a "slide mold" works, but I'm sure glad the folks at Dragon do! That said, I'm always thrilled to see a 20- or 30-year old kit built and painted particularly well. Only the best modelers can take an old, 70s era ERTL or Hasegawa kit and turn it into a masterpiece. It gives me hope for all those "obsolete" kits I see on the vendors' tables at IPMS contests. 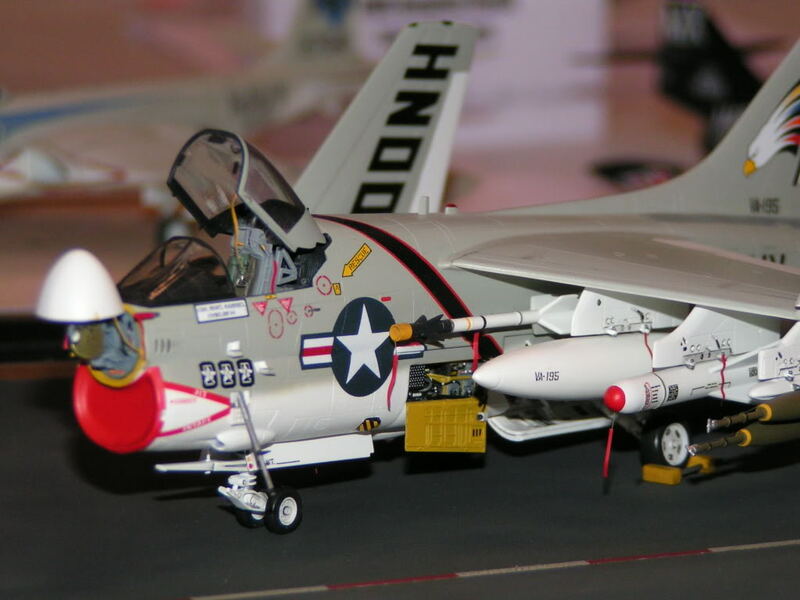 This 1/72 A-7A, from Floridian Ken Belisle, started life as a Hasegawa kit. Yes, the same one released in the 1970s with minimal cockpit detail and raised panel lines. It stopped me in my tracks when I saw it at the Virginia Beach IPMS Nats a few years ago. Ken is, in my opinion, the best 1/72 scale modeler in the hobby these days. He could've built the Fujimi kit, which is miles ahead of the Hasegawa, but he used what he had in his stash and showed us what real modeling looks like. Here's a build of an "obsolete" kit I spotted on Aircraft Resource Center this week. It's the old ESCI 1/48 F-4 Phantom, and I think it would pass for a Hasegawa kit in any contest. The finish really sets it above most kits we see online. I also noticed this build from André Teppers on Missing Lynx of the venerable Italeri 1/35 Steyr RSO (which has recently been superseded by Dragon's new offering). I can't wait to see this one painted! Do you have old kits in your stash that you're too quick to dismiss? I've just come across this while looking at some things on Britmodeller, and thought I'd provide an answer to your question. I have many (many) old kits in my stash as well as the latest and I never dismiss the old ones. They are ones that I learned on in the '70s and can still build into admirable representations.